Vas-y, il fait beau dès mercredi et c'est accessible à tous ! Cette zone a servi de staging pour engins de chantiers et de base vie pour les ouvriers. En effet c'est une zone réservée pour de futurs développements et je crois bien que de base c'est pour un éventuel futur hôtel. Et pourquoi pas pour un parking ? Car à ce que je voit, il n'y a qu'un seul parking pour bus et voiture. Certes, il y a le métro et l'aéroport... mais bon.. Je doute que le parking ne soit suffisant pour le parc. "Tire la chevillette, et la bobinette cherra." Et il y a un autre terrain à gauche du Disney Shangaï Hotel sur la photo en haut à gauche. Je trouve les tapis bizarre. J'aime bien les gels douche et la carte mais la moquette est moche et pourquoi tous ces tapis ? Membre actif du club très privé : Outsidears ! Attention je suis un noble maintenant, Tiers-Etat taisez vous ! Je pensais plus au parc. Le Disney Town j'irai surement voir ça durant le week end.. Dash, tu nous en racontes un peu plus ? Es tu retourner au Disney Town ? Et surtout, as-tu visité le parc ! Jette un coup d'œil aux sujets individuels des différents lands du parc, tu y trouveras les commentaires et impressions de Dash sur chacun d'entre eux ! A partir du jeudi 16 juin 2016, le centre-ville de Shanghai (Bund) sera relié à Shanghai Disney Resort par un service de navette. Les départs des bus se feront à l'heure (et éventuellement à la demi-heure si la demande est forte). Il faudra compter environ 45 minutes de trajet et le coût du billet aller simple est annoncé à 25 yuan (soit 3,40 euros). 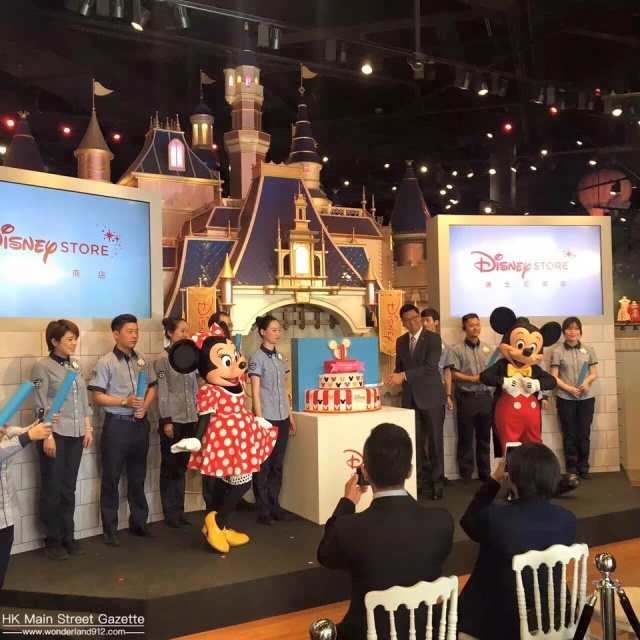 Le Disney Store de Shanghai Lujiazui, le plus grand au monde avec ses 5.000 m² de marchandises, célèbre déjà son premier anniversaire ! Ce flagship store fut aussi le premier point de vente à proposer des articles estampillés Shanghai Disneyland ! Photo : The Walt Disney Company China. Photo : HK Main Street Gazette. 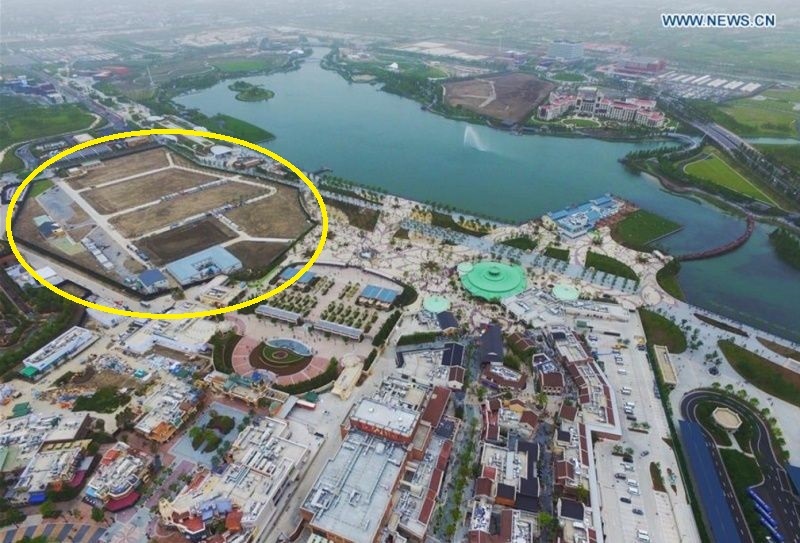 Shanghai Daily nous apprend que près d'un million de chinois (960.000) se sont déjà rendus dans la Shanghai International Tourism and Resorts Zone où se situe Shanghai Disney Resort (et le complexe commercial Shanghai Village qui a ouvert hier) depuis le début de la période d'essais. La journée la plus chargée fut celle du 1er mai avec 110.000 visiteurs ! NEARLY a million people have visited the Shanghai International Tourism and Resorts Zone, home of the Shanghai Disney Resort, since a trial operation was launched on April 26. The overall operation is running smoothly, but the authority has found over 100 problems in four main categories that need to be addressed, Liu Zhengyi, the executive deputy director of the zone’s management committee, told a press conference yesterday. “The problems are mainly with the traffic facilities and management, safety standards and law enforcement abilities, as well as emergency plans to handle big crowds and guest services,” Liu said. The committee is working around the clock with the Disney operator and government bodies to solve the problems, she added. About 960,000 people entered the zone during the 23-day trial operation, including those who were invited to take part in the trial operation of the Shanghai Disneyland. The largest number of visitors at one time — 110,000 — came on May 1, according to Liu. Entry tickets for Shanghai Disneyland for the first two months after its grand opening on June 16 have been sold out, according to the theme park’s operator. 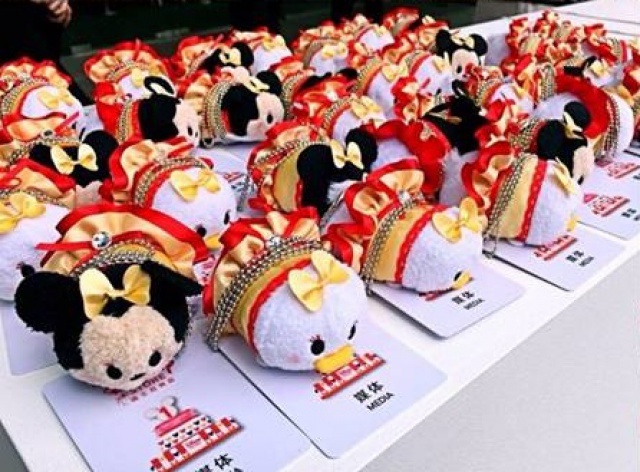 Massive crowds and heavy traffic volumes are expected in the zone on weekends and holidays after the official opening of Shanghai Disneyland, said Li Guirong, director of the Pudong public security bureau. “The entrance and exit of Metro Line 11’s Disney Station, the public square in front of the Disneyland and several bridges are most likely to attract large numbers of of visitors,” Li said. Evacuation plans have been made for each location and they have been tested during the trial operation. Hi-tech equipment, such as thermodynamic detectors, and a special traffic management system will be used to forecast and manage visitor traffic, he said. A headquarters has been set up within the zone to manage the situation. On peak days, the traffic police will inform motorists through radio, microblogs and Wechat about detours, parking and public transportation, Li said. However, visitors are strongly advised to use public transport, especially the Metro, to get to the zone, he added. Line 11 will operate until 10:30pm every day and that may be extended to accommodate increased traffic, said Yang Xiaoxi, deputy head of the city’s transport committee. On peak days, passengers will be asked to wait outside and enter the station gradually. Shanghai Daily - 20 mai 2016. Globalement, je suis mitigé sur ce nouveau Resort. Ensuite les attractions présentes niveau effets rien à dire, c'est moderne, mais je trouve la plupart des rides bien trop court. Nouveau partenaire pour le resort : Guangzhou Liby Corporate Group qui devient sponsor de Camp Discovery à Adventure Isle. 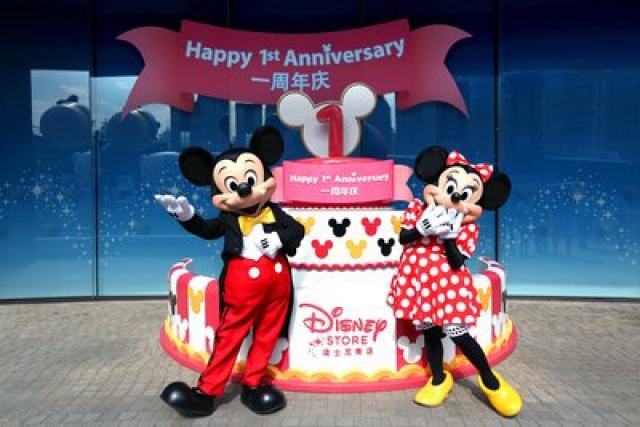 (Shanghai, May 20, 2016) – Shanghai Disney Resort and Guangzhou Liby Corporate Group (“Liby”) have entered into a multi-year strategic alliance which recognizes Liby as an official sponsor of Shanghai Disney Resort. 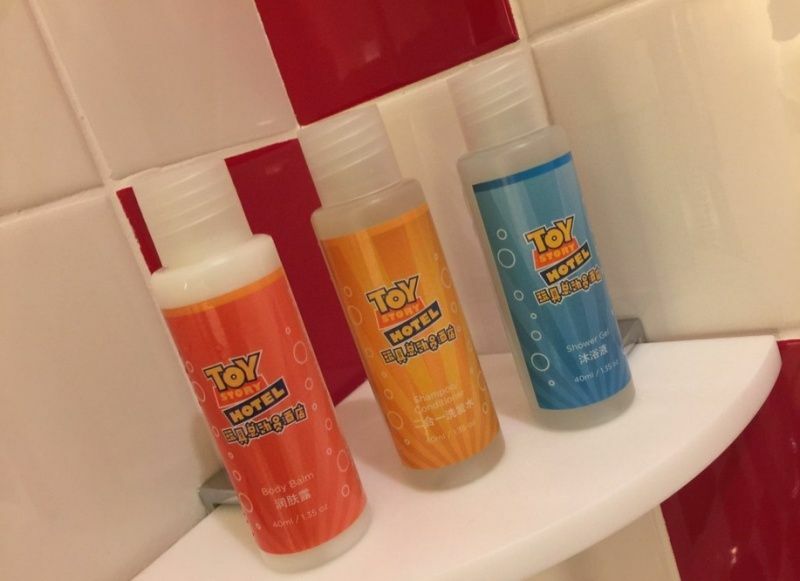 In addition to having a brand presence in Camp Discovery at Adventure Isle, Liby will provide complimentary in-room product samples to guests of the Shanghai Disney Resort hotels. Located in Adventure Isle area of the theme park, Camp Discovery is home to the Challenge Trails and Excavation Site for adventurers of all ages to explore. In the Challenge Trails, three uniquely thrilling elevated rope courses traverse the terrain of Roaring Mountain – taking adventurers over river gorges, waterfalls and sheer cliffs, through stunning terrain and into spectacular caverns. Excavation Site is a hands-on dig zone, where young archeologists can discover fascinating relics embedded in rock and buried in sand. Slides and other engaging activities among the ruins make exploring this area extra fun. 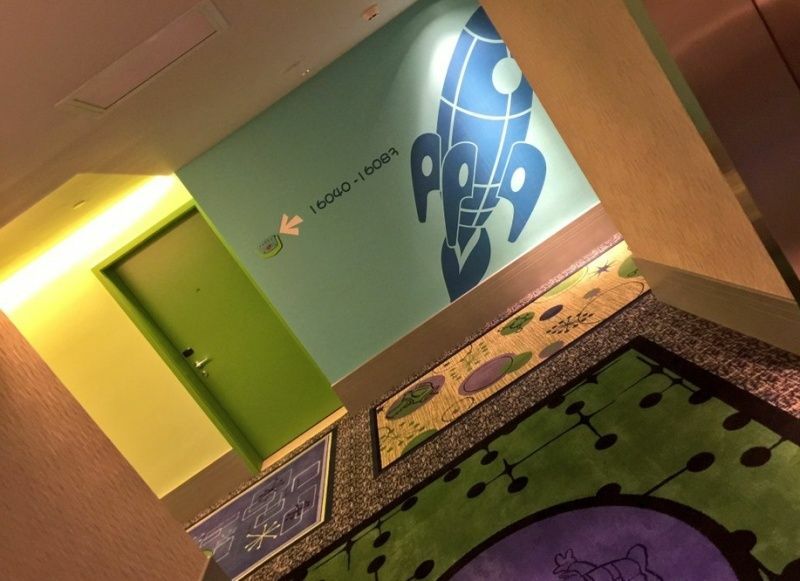 Special signage throughout Camp Discovery will mark Liby’s involvement as a resort sponsor. 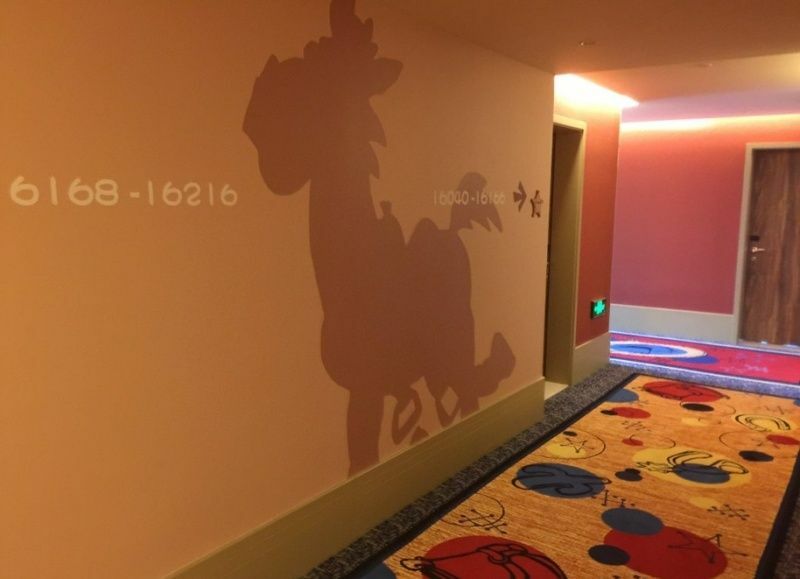 Shanghai Disney Resort is home to two uniquely themed resort hotels – the elegant, Art Nouveau-inspired Shanghai Disneyland Hotel and the whimsically fun Toy Story Hotel. Through this agreement, Liby will provide hotel guests with single use laundry detergent samples. Shanghai Disney Resort - 20 mai 2016. Par rapport à ça je suis retombé sur l'image d'un plan datant de 2015 ou on peut voir l'hotel a cet emplacement ainsi que leur Everest en haut à droite. 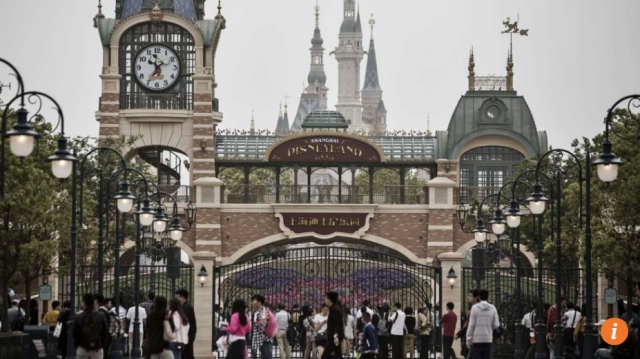 Is China building too many theme parks ? Dozens of amusement and theme parks in various styles and motifs are springing up in China, giving rise to fears of an impending bubble in the property sector. Be it the Disneyland in Shanghai, Water Park in Shenzhen or Hello Kitty Park in Anji, Zheijiang province, one can find facilities of various hue across the length and breadth of the country. The latest developer to expand its theme park offerings is billionaire Wang Jianlin’s Dalian Wanda Group, which started work on its 11th “Cultural Tourism City” in Guilin, Guangxi province, on Friday. With three parks already running, the group targets to have 15 “Cultural Tourism Cities” by 2020. Carnival Group International, another tourism property developer, said it plans to have more than 10 theme parks in next five years across China’s first- and second- tier cities. Its debut project, a large scale beachside theme park contains amusement facilities, observation wheel, cinema and other outlets, in China’s northern port city of Qingdao, is scheduled to open next month. With China determined to boost domestic consumption, some analysts and industry experts believe that there is huge room for further theme park development, while others feel that only the tough will survive. “Chinese holidaymakers are making more domestic trips due to the economic slowdown and the devaluation of the yuan,” said Jennifer So, a tourism analyst at China Securities International. With the rise of the middle class, there has also been a sea change in preferences. Chinese consumers tend to be more interested in leisure, sightseeing and services instead of purely shopping. With central government policies remaining favourable, it could be the mainstay for higher domestic spending, So said. Haichang Ocean Park, the largest marine theme park operator in China, has already gained from the growing demand and seen its net profit rise by 20 per cent last year. Gao Jie, chief strategy officer at Haichang, said the company could reap the harvest now because it entered the industry as early as the 1990s and has already opened eight parks. The operator targets to have four more parks open by 2020, including one under construction in Shanghai. 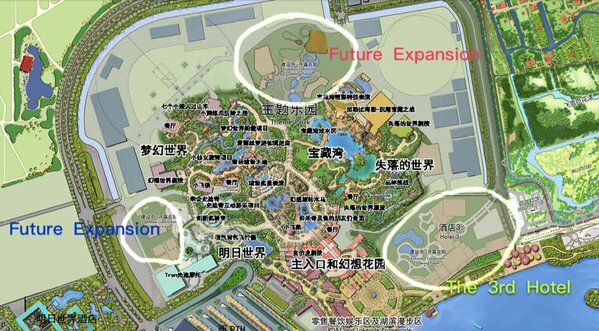 Gao doesn’t anticipate any challenge from the Shanghai Disneyland resort which is slated to open in June. “We would have a cluster effect, like Hong Kong’s Disneyland and Ocean Park.” He noted Haichang’s advantage in having its own sea animals and a good knowledge of conservation practices. The US-based consultancy Aecom expects China to surpass the US as the biggest theme park market in the world by 2020, drawing 221 million people by that time, nearly double the number last year. Meanwhile, China is building parks faster than any other country in the world. Last year, 21 theme parks opened in China, with another 20 parks under construction. There are nearly 300 theme parks across the country, according to a eport. Meng Cai, the executive director at Carnival, says China has enough room to support new parks as modern leisure facilities for families are in short-supply. Meng said that tourism property developers who focus on selling properties rather than tourism, rarely succeed. Carnival, for instance, is transforming from a home developer to a tourism complex builder, that would rely on existing park revenue and co-funding for future development. A number of traditional property developers are rushing to theme parks for business diversification. China Securities’ So said this used to happen in the 1990s and most of the theme parks went bankrupt at the time. But she is less optimistic this time, believing that most firms would lose money. Intellectual property and management expertise is still the key for running theme parks which most of the developers don’t have, she said. In addition, there is also fierce competition from foreign giants. According to some reports, 80 per cent of the theme parks that were set up in the last 10 years have closed down. A US$3.3 billion Universal Studios park is slated to open in Beijing in 2019 and a Six Flags park in Tianjin in 2018. SCMP - 24 mai 2016. 960.000 personnes ont déjà visité le parc Shanghai Disneyland alors qu'il se trouve seulement en période de soft opening, comme on peut le lire dans le Los Angeles Times La journée où il y a eu le plus de monde était celle du 1er mai (jour férié en Chine), avec 90.000 visiteurs ce jour là. L'ouverture au grand public aura lieu le 16 juin. Il n'y avait pas de visiteurs à Shanghai Disneyland le 1er mai, ils étaient tous contenus dans Disneytown et Wishing Star Park. Shanghai Disneyland a accueilli ses premiers visiteurs en ouverture test le 7 mai. Illustration : Shanghai Disney Resort. 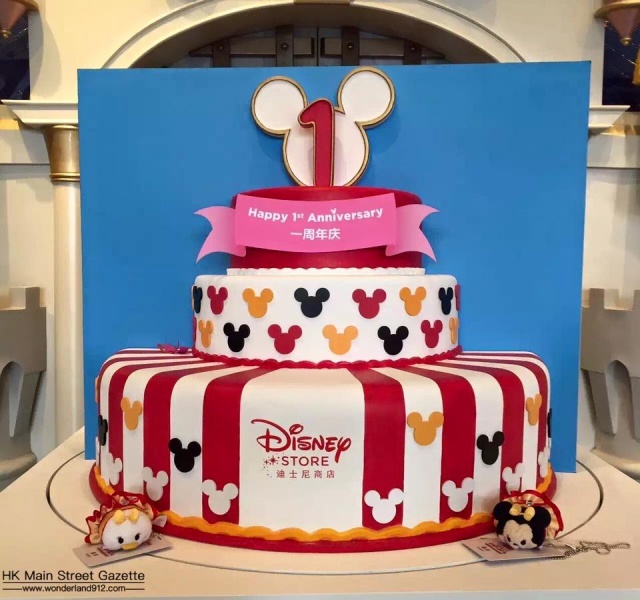 As authorized by the State Post Bureau, China Stamp Group will issue two official Shanghai Disney Resort stamps June 16 – the same day Shanghai Disney Resort welcomes the general public for the first time. Leadership from Shanghai Municipal People’s Government, China Post Group, The Walt Disney Company, Shendi Group, Shanghai Disney Resort and the Shanghai International Tourism and Resort Zones Administrative Commission came together May 31 at a jointly held ceremony where the stamp designs were unveiled. 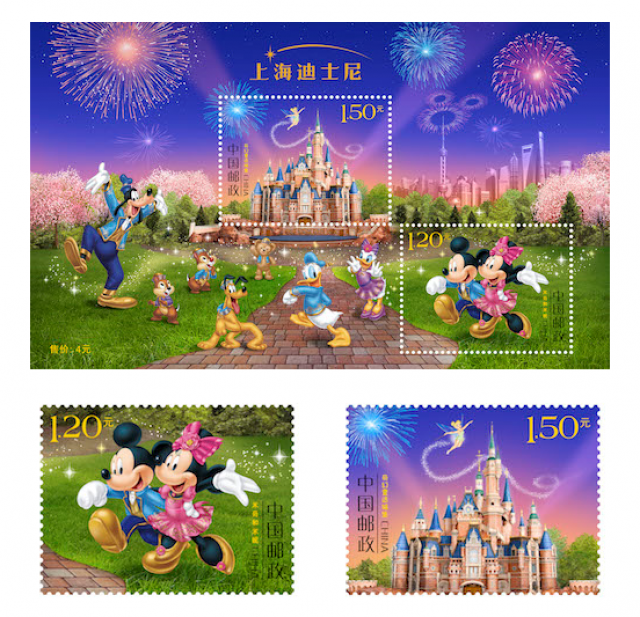 The Shanghai Disney Resort official stamp collection includes two stamps and one souvenir sheet, featuring classic characters and the iconic Enchanted Storybook Castle. “Mickey and Minnie” shows Mickey Mouse and Minnie Mouse strolling in their official Shanghai Disney Resort attire. The design of their clothing incorporates special features in appreciation for the people and culture of China, such as the Mandarin collar and peony. The “Enchanted Storybook Castle” stamp shows the grandeur of the world’s largest and most interactive Disney castle, with Tinker Bell soaring overhead and fireworks lighting the night sky above. Located at the heart of Shanghai Disneyland, Enchanted Storybook Castle represents all the Disney princesses and includes Chinese elements such as peony and magnolia flowers to represent Shanghai. Shanghai Disney Resort - 31 mai 2016. 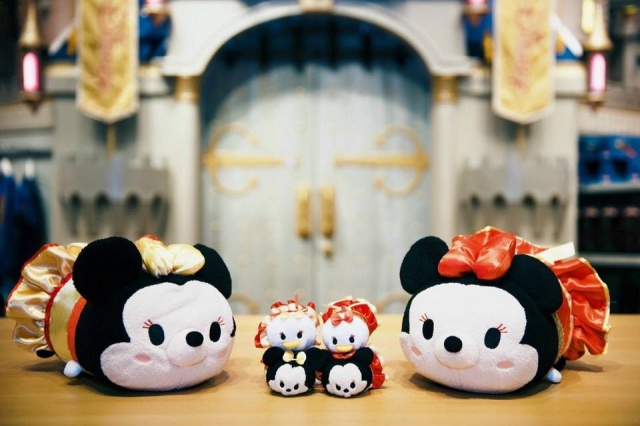 Shanghai Disney Resort and Tmall have entered into a multi-year strategic alliance which recognizes Tmall as the exclusive e-commerce sponsor of Shanghai Disney Resort and presenting sponsor of Pirates of the Caribbean: Battle for the Sunken Treasure attraction. Located in the Treasure Cove, the first pirates-themed land in any Disney theme park, Pirates of the Caribbean: Battle for the Sunken Treasure is one of the most immersive and technologically advanced attractions at Shanghai Disneyland. Guests board boats and set off on an epic adventure through an original story where Captain Jack Sparrow battles Davy Jones over his gold. The attraction utilizes dimensional sets, large format high-resolution media, special effects, an innovative ride system and the latest advances in Disney’s Audio-Animatronics technology. This signature attraction was designed especially for Shanghai Disneyland. “We are excited to be the presenting sponsor of Pirates of the Caribbean attraction, and joining Shanghai Disney Resort from its grand opening as an official sponsor. Tmall is committed to enhancing the quality of life of Chinese consumers by introducing and associating with top quality brands worldwide. We look forward to working with Shanghai Disney Resort in the years to come,” said Chris Tung, Chief Marketing Officer of Alibaba Group. Shanghai Disney Resort - 8 juin 2016. De gauche à droite : Mickey Mouse, Bob Iger (Chairman and CEO of The Walt Disney Company), Song Yi Qiao (Shanghai Charity Foundation Vice Chairperson), Jing Dunquan (China Soong Ching Ling Foundation Vice Chairman), Jiang Zhongyi (Shanghai Children's Medical Center Director) et Minnie Mouse. To celebrate the grand opening of Shanghai Disney Resort, The Walt Disney Company today announced a $3.1 million USD (RMB 20 million) donation to fund Disney-themed play spaces and therapeutic play activities at children's hospitals across China. Disney Chairman and Chief Executive Officer Bob Iger announced the gift at the Shanghai Children's Medical Center. Over the course of the five-year program, the donation will provide more than 50 hospitals in China with play rooms and therapeutic play activities. 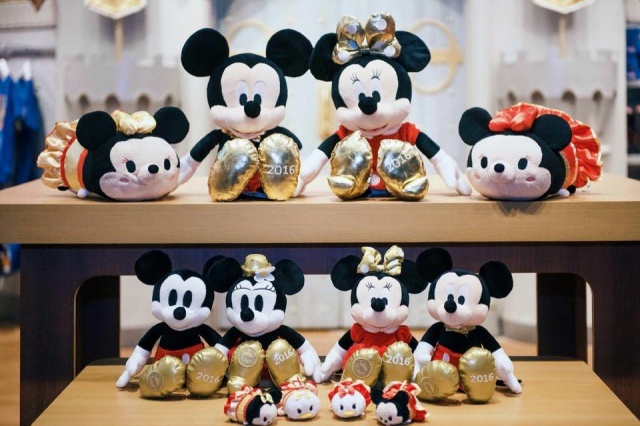 Disney will also donate Shanghai Disneyland theme park tickets to support children and their families as they undergo and recover from treatment. "In honor of the grand opening of Shanghai Disney Resort, we are creating a bit of Disney magic where it is needed most. With our gift of 20million RMB and tickets to our new theme park, we hope to bring happiness and laughter to children and families in hospitals across the country by creating opportunities to play and spend quality time together," Iger said. The donation will be administered by the Shanghai Charity Foundation for children's hospitals in and around Shanghai, and by the China Soong Ching Ling Foundation for hospitals in the rest of China. The play curriculum and training will be designed and implemented by Right To Play, a non-profit organization that uses the transformative power of play to educate and empower children to overcome adversity. "Over the past few years, the Shanghai Children's Medical Center has built several children's play spaces with support from The Walt Disney Company," said Jiang Zhongyi, Director of Shanghai Children's Medical Center. "This new fund not only showcases Disney's social responsibility and support for children, but also helps promote innovative new therapeutic play concepts that are helping transform children's healthcare." Disney's support of children's hospitals dates back to the 1930s when Walt Disney would visit with children, often accompanied by Disney characters and animators. Today that support includes millions of dollars in annual grants and donations that provide play spaces, theme park tickets, first-run movies, care packages, in-kind support, and hospital visits from beloved Disney characters. 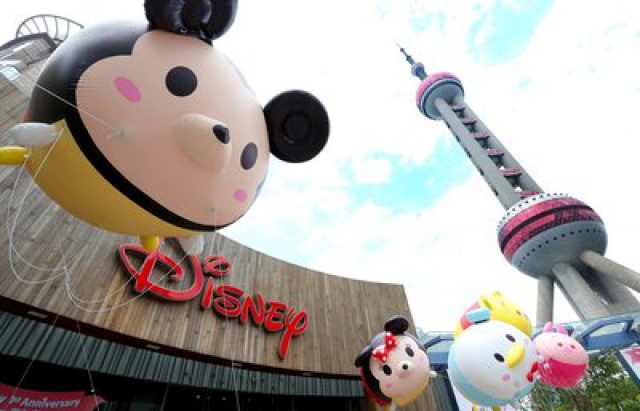 Disney has already supported several children's hospitals in Shanghai through the development of play spaces, play therapy training, and character visits. Disney VoluntEARS have made more than 150 hospital visits and benefited more than 12,000 children and their families. The Walt Disney Company - 8 juin 2016. To celebrate the upcoming opening of Shanghai Disney Resort, The Walt Disney Company will donate $3.1 million USD (RMB 20 million) to fund Disney-themed play spaces and therapeutic play activities at more than 50 children’s hospitals across China over the course of the five-year program. Disney will also donate Shanghai Disneyland theme park tickets to support children and their families as they undergo and recover from treatment. 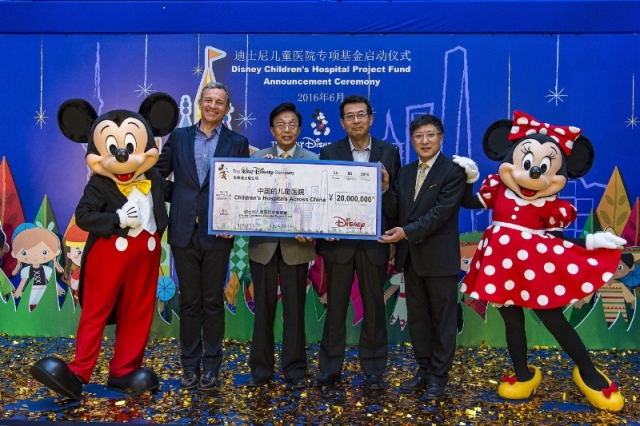 Disney Chairman and Chief Executive Officer Bob Iger announced the gift at the Shanghai Children’s Medical Center. “In honor of the grand opening of Shanghai Disney Resort, we are creating a bit of Disney magic where it is needed most. 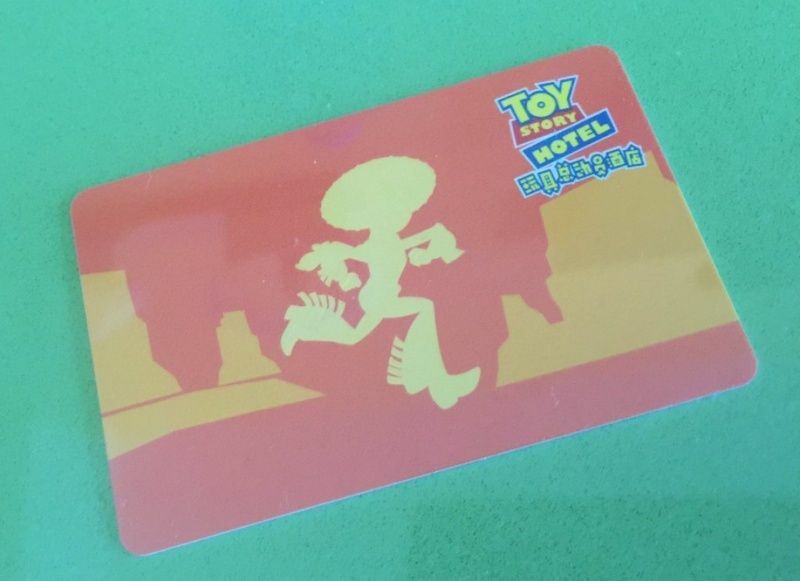 With our gift of 20 million RMB and tickets to our new theme park, we hope to bring happiness and laughter to children and families in hospitals across the country by creating opportunities to play and spend quality time together,” Iger said. Disney’s support of children’s hospitals dates back to the 1930s when Walt Disney would visit with children, often accompanied by Disney characters and animators. Today that support includes millions of dollars in annual grants and donations that provide play spaces, theme park tickets, first-run movies, care packages, in-kind support, and hospital visits from beloved Disney characters. Erine Glover pour Disney Parks Blog - 8 juin 2016.